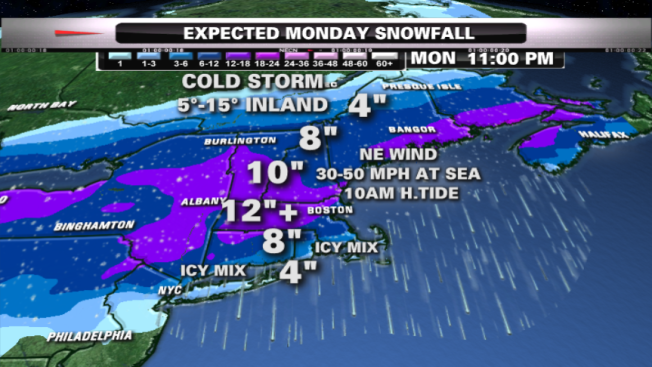 About a foot of snow is likely in much of New England Monday. Very cold air has hit New England ahead of an approaching storm, setting the stage for a snowy morning commute. Low pressure responsible for a foot of snow from Chicago to Detroit will do the same in much of New England for our Groundhog Day Monday. Snow advances west to east after midnight, with one-to-two-inch-per-hour snowfall for about six hours Monday morning. The exception is in Maine, where snow arrives during the morning. The storm center will track to central New York late morning, then redevelop south of Long Island midday. Enough warm air will be drawn in from the south for a change from snow to sleet and freezing rain in much of Connecticut, Rhode Island and southeastern Massachusetts, to plain rain on Cape Cod. Locations that get a change will have about four inches before the transition, then back to snow with a rapid refreeze during the evening. From about Hartford, Connecticut, to Boston and points north, it is a very cold snow storm with one inch per hour snow for close to 10 hours. A widespread foot of snow is likely with high 5-15 inland, near 30 at the shore with a rapid temperature drop as wind shifts from northeast to north and northwest late in the day. Wind at the shore may gust past 50 mph from the northeast midday, with minor flooding at high tide before noon. Snow will end from west to east late for most of New England, and in Maine during the evening. High pressure whips in on a gusty northwest wind Tuesday, with a mix of sun and clouds, highs 10-15 north and 15-20 south. Wind from the northwest will be 15-30 mph. A warm front arrives Wednesday with light snow, and snow or rain at the south coast, during the afternoon. Snow is likely Wednesday night, with about three inches of accumulation, but higher amounts in the mountains. Thursday is windy and colder, with highs in the single digits north and teens south. Ms. G, Massachusetts new official groundhog, will not see her shadow. That means winter is almost over!